With their soft touch, they separate, stretch and align delicately your toes. Made of a soft, washable material. Suitable for home and for sleeping. 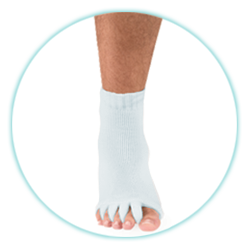 You will just have to place your toes in their holes to enjoy an immediate relief of your pains, hammer toes, bunions, cramps and much more.